Security and safety., intelligence and ingenuity, initiative, dynamism, and versatility: this is the meaning behind the three drawings that logo the logo of Ghana Health and Education Initiative (GHEI), an organization that pursues better heath and education for the communities of Humjibre, a town in Western Ghana. Founded in 2002 by Diana Rickard and Clement Donkor, GHEI is the result of her passion for health, and his passion for education. Rickard was as American medical student when she first visited Ghana in 2001 to volunteer at a hospital. She went back to Ghana some months later and found a chance to partner with the village leaders in Humjibre. On this trip, she met Clement Donkor, a local leader, and teacher. Being a small non-governmental organization offers a challenge on how to fundraise for the large number of activities and programs that they offer. However, they are up to it, says Michael McGaskey, Communications Officer at GHEI. "By discovering new coordinators from abroad to blend with our Ghanaian staff, we have found really creative people. Those special people act as the catalyst in us doing amazing things. Our partnerships have also been wonderful throughout the years", he explained. The fight against the malaria is a big issue for many African countries. In Ghana, the disease - spread by mosquitos - has a high rate, and GHEI has been working to fix the problem. Besides offering support and education about malaria, for over ten years they have been distributing long-lasting insecticide-treated bednets (LLINs), one of the best methods to prevent the illness. Over 5,400 LLINs have been distributed in the community, increasing the number of nets by 48 per cent. Efforts such as these are helping the countrie's overall infection rates. The Ghana Malaria Control Programme Periodic Bulletin reported a significant reduction in deaths attributed to malaria, comparing 2015 with 2016, with a decrease of 7.3 percent in the number of hospital admissions, and a 40 per cent fewer deaths. Launched in 2016, the Mother Mentor Program is the newest project of GHEI. Pregnant women are paired with trusted mothers in the community who serve as mentors from the beginning of pregnancy through the first two years of the child's life. The goal is to keep the mother and baby healthy, and also reduce maternal stress for first-time mothers. "Participants receive vouchers for nutritious food they can redeem at their local market, a latrine toilet if they do not already have one, a handwashing and soap station, a treated bed net, enrollment in the national health insurance, as well as packages with necessary items for delivery and postpartum", explained McGaskey about the Program. McGaskey says that it is hard to imagine the community of Humjibre without GHEI, and a good example comes from the library that the organization constructed in 2005. The collection features over 6,500 books, including mostly children’s storybooks, textbooks, and African-authored books. It's a place where the children can go to after school to keep their minds engaged. "Many children in Africa grow up without actual toys which force many of them to use their imagination. The library is a perfect environment to jump start the creativity of these young minds", said McGaskey. The organization also supports gender equality and women empowerment. In many rural areas of the country, women are forced to quit their education to take care of the house, and their education is considered an economic onus. 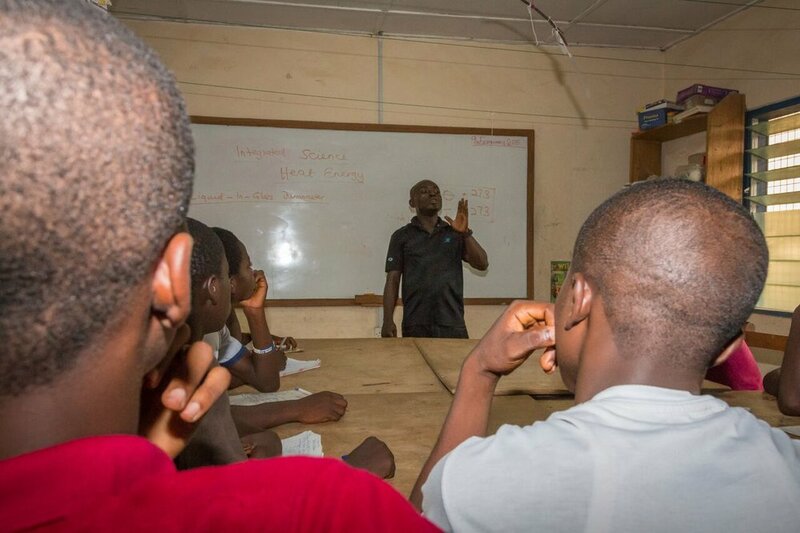 In July and August of 2017, GHEI organized a Girl's Empowerment Camp, that according to McGaskey, was important due to the fact that in some regions of Ghana, it is rare to find a woman in certain careers typically dominated by man. "This Camp is about being different, which is something that young girls need to believe they can do. The days of relying on others are no more and it is imperative that young ladies pursue their own education with their own careers in mind", he said. Felicity Yaa Pomah, or Feli, as she is called in the community, is a former member of the YEP (Youth Enrichment Program) and also a scholarship recipient thanks to GHEI's support. After completing her education, she was hired as a teacher at the same after-school program that helped her grow into the person she is today. Now, she attends classes on the weekends to further her teaching credentials. "It is inspiring for girls in Humjibre to see and hear about her story so she also is highly active in leading many 'Girls Empowerment Camp' sessions. We believe in building local leaders to impact the community and that's exactly what she is doing", said McGaskey. Photographer Rohit Lakhani went to Ghana to photograph the projects of GHEI. He explained he was drawn to the organization while looking at the different options at the PWB website. "I just felt a closeness to it. I grew up and had lived in Ghana for so many years. With the PWB project, I had wanted to be involved with such an enriching experience, to go there and be involved with a project like this", stated Lakhani. He said the balance of the experience was very positive. "There was so much love there. As a global family, we need to love each other more, to care for each other more (...) I learned a lot. We need to support each other as one humanity. We are one family". To learn more about the many projects of GHEI and to support the organization, please click here.